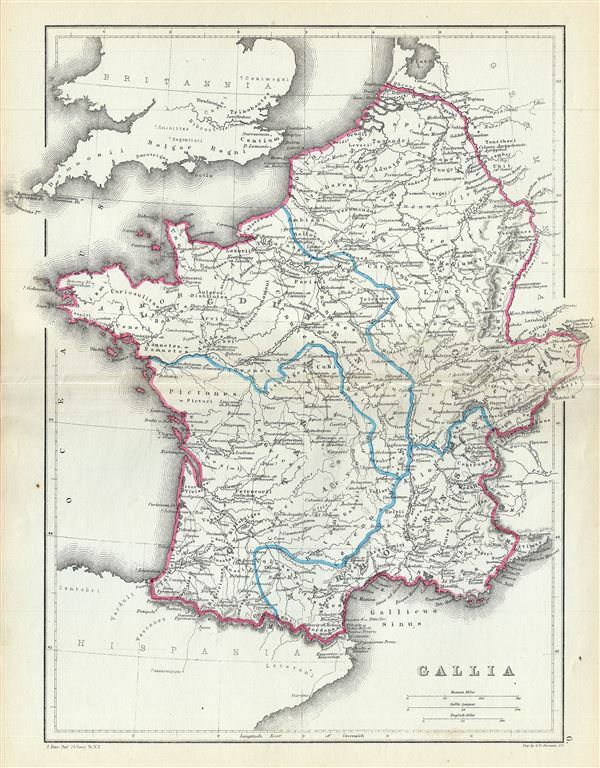 A fine 1867 map of Gaul or Gallia or France by William Hughes. The map covers Gallia during the ancient Roman times and covers from the English Channel south as far as the Pyrenees Mountains and Hispania. It includes the modern day nations of France, Luxembourg, Belgium, Switzerland and the Netherlands. It identifies several important cities and towns and uses ancient names throughout. The Roman provinces of Lugdunensis, Narbonensis, Aquitania and Belgica are also noted. This map was created by William Hughes, printed by J. Bien and engraved by G.E. Sherman, for issued as plate 6 in Sheldon and Company's An Atlas of Classical Geography.